Published by Patumwan November 28th, 2007	in Builders, Customs and Editorial. They are all beautiful models, but I am a little bit surprised by his selection. Would have thought more hot rods in the stable. I take any of them. That’s the sort of public image the MC industry needs. Not the embarrassing, dysfunctional clowns. Arlen is a great role model for our industry and by all respect Cory has talents too growing his business into what it is today. Our industry needs more people like Arlen to promote it in a positive fashion. 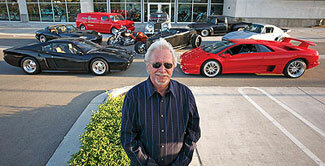 Next month, i intend to visit Arlen Ness store in Dublin. Are these cars exhibited at his store or do they stay in his garage? Arlen is just up the road. Last time i was by there he had only bikes. However, he has an upper floor full of old custom scooters and some vintage bikes that are really worth seeing! So a rich old guy has a bunch of toys… boring!